Contains fructose as found in fruit. It has increased levels of Vitamin A and other key nutrients and is fruit flavored. 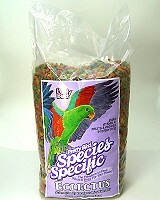 Shipped in factory bag or sealed plastic bags from bulk based on availability. Corn, Oat Groats, Soy Concentrate, Corn Gluten Meal, Wheat, Fructose, Soya Oil, Coconut Oil, Raisins, Coconut, Papaya, Apricot, Banana, Sweet Potato, Pineapple, Apple, Spinach, Broccoli, Carrots, Dates, Calcium Carbonate, Dicalcium Phosphate, L-Lysine, Choline Chloride, Natural and Artificial Flavors, DL Methionine, Isoleucine, L-Threonine, L-Tryptophan, Vitamin E Supplement, Ascorbic Acid (Vitamin C), Ferrous Sulfate, D-Biotin, Yucca Schidigera Extract, Zinc Oxide, Manganous Oxide, Niacinamide, Magnesium Oxide,Vitamin B12 Supplement, Mixed Tocopherols, Copper Sulfate, Calcium Iodate, Citric Acid, Calcium Pantothenate, Vitamin A Supplement, Sodium Selenite, Folic Acid, Riboflavin, Pyridoxine Hydrochloride, Thiamine Mononitrate, Natural and Artificial Colors, Menadione Dimethylpyrimidinol Bisulfite (source of Vitamin K3), Vitamin D3 Supplement, Cobalt Sulfate, Rosemary Extract. Crude Protein (min) 16%, Crude Fat/Oil (min) 6 %, Crude Fiber (max) 3 %, Moisture (max) 10 %, Ash (max) 4 %, Vitamin A (min) 17,500 IU/kg, Vitamin D3 (min) 800 IU/kg, Vitamin E (min) 200 IU/kg, Copper (min) 10 mg/kg.